The DrinksReform.org team recently made a trip to Richmond, Virginia to visit the Library of Virginia's Teetotalers & Moonshiners exhibit. Given Virginia's rich history with moonshine, Richmond is an ideal location for such an exhibit. The exhibit is open through December 5, and it tells the story of how Prohibition started local before going global. The display starts by recounting the time period right before national Prohibition, when Virginia already was starting to clamp down on booze. In 1877, the state legislature started taxing alcoholic spirits, and by 1886 it gave counties the ability to shutter saloons and other drinking establishments within their borders (what became known as the "local option"). On the brink of Prohibition going national, nearly 90% of Virginia counties had shut down their drinking establishments. Not satisfied with the local option, Prohibition fever--spurred on by the Progressive and Temperance movements--quickly advanced to the state level, where in 1914 the legislature approved a ballot referendum on statewide prohibition. State citizens voted in favor of the statewide booze ban, although the exhibit notes that African Americans and the white working-class--two constituencies who disfavored the ban--were largely excluded from the vote. While Prohibition wouldn't become nationalized until 1920, Virginia wasted little time in commencing its crackdown on bootleggers. November 1, 1916 was the official "last call" for Virginia distillers, breweries, and bars; most went out of business during the dry years, although some large companies were able to stay afloat by switching their production to beverages such as soda. "Prohibition created a thriving underground economy and culture. Those in the know used passwords and secret knocks to access 'nip joints' and speakeasies. Moonshiners, makers or sellers of illicit whiskey, hid their operations in remote rural landscapes. Hidden compartments in clothing, everyday items, and even cars moved alcohol from place to place." 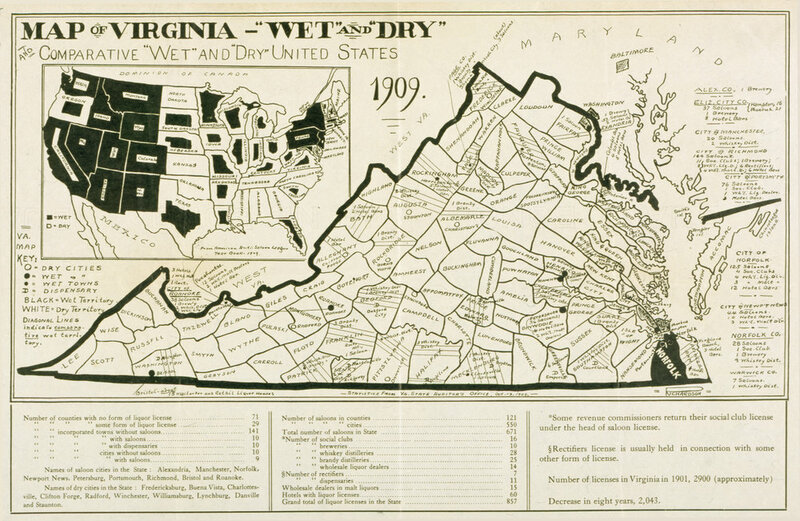 "[During Prohibition] Virginia's backwoods distillers were forced underground. Moonshining in the Blue Ridge Mountains became so notorious that Franklin County, in the southwest corner of Virginia, was dubbed the "Moonshine Capital of the World," after it was estimated that 99 out of 100 county residents were involved in the moonshine trade. Before Prohibition, 'getting moonshine in areas like Franklin County was not much different from buying eggs or milk,' says Matt Bondurant. Bondurant's novel, Wettest County in the World, is based on his grandfather's moonshining exploits in Franklin County. Matt's brother Robert now runs Bondurant Brothers Distillery, which distills unaged whiskey not far from Franklin. 'But when Prohibition came around, then it became a potential money-making possibility,' says Bondurant. Money led to crime, which in turn led to the dramatic law-enforcement raids, car chases and prosecutions that so many Americans associate with Prohibition-era moonshining. Moonshiners were forced to operate in remote Appalachian regions like Franklin to avoid detection, and they went to great lengths to hide their efforts — including burying their stills underneath fake graveyards back in the mountains. Perhaps the most interesting part of the exhibit was its discussion of Prohibition's legacy. Although it notes that Prohibition "barely stemmed the flow of alcohol across the country," it also points out that certain vestiges of Prohibition are still with us. Namely, in 1933, when Prohibition was repealed, Virginia established the Alcoholic Beverage Control department to regulate booze within the state. Other states likewise passed comprehensive regulatory regimes governing alcohol in the immediate aftermath of repeal. Unfortunately, this post-Prohibition regulatory structure remains mostly intact to this day. As R Street has noted in the past, Virginia labors under some of the worst alcohol laws in the country. It remains a "control state" in which distilled spirits can only be sold in government-operated liquor stores, and it severely taxes and handicaps its spirits producers. Indeed, while it's tempting to view an exhibit like Teetotalers & Moonshiners as merely a window into a long ago past--one that will remain relegated to the dustbin of history--the legacy of Prohibition still haunts us in many ways. More than anything, learning about the Prohibition Era underscores the importance of pursuing rational alcoholic beverage laws that promote free enterprise and consumer choice. A moonshine still confiscated by ABC agents in 2011. Virginia tries the "local option"
Prohibition goes statewide in Virginia. Law enforcement seizing illegal spirits.